Monday, 29. June 2009 Rhein Chemie's new compounding plant at its Mannheim-Rheinau site is a milestone in the company's over 100-year history. At the facility, which has been equipped with state-of-the art technology, Rhein Chemie manufactures its globally successful Rhenogran® product line. Rhein Chemie’s new compounding plant at its Mannheim-Rheinau site is a milestone in the company’s over 100-year history. At the facility, which has been equipped with state-of-the art technology, Rhein Chemie manufactures its globally successful Rhenogran® product line. The pre-dispersed, polymer-bound rubber chemicals are used to manufacture rubber goods, such as sealing elements, hoses, belts and tires. The two main production lines already began operating last December; another went on line in May. Rhein Chemie invested some EUR 7 million to build and house the new production systems and to modernize existing plant sections. 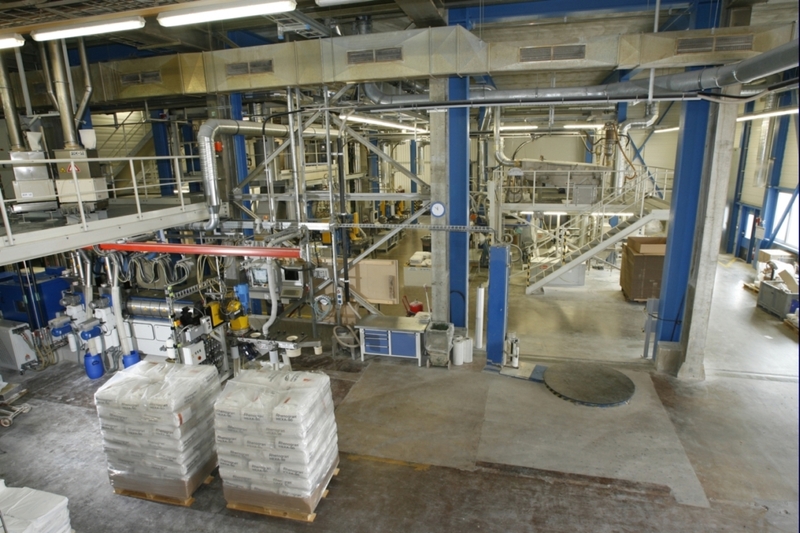 A modern production building was erected to combine two compounding plants. The plant periphery, including process control systems, raw material transport equipment and site logistics, was redesigned for greater efficiency. The simplified workflows and new technology ensure more flexible production. Space requirements and energy consumption both have been reduced. A number of investments have been made in recent years to modernize production at Rhein Chemie headquarters in Mannheim: The plant for processing promoters (Aflux®, Aktiplast®) was revamped in 2003, and the company built a facility for service products in 2006. With the start-up of the new compounding plant, Rhein Chemie now has a high-performance production facility that represents the absolute state of the art in technology and meets all environmental requirements. “At the same time, this step shows our strong commitment to our German site in Mannheim,” adds Dr. Anno Borkowsky. Rhein Chemie is a company with a successful track record in customized additives and service products stretching back over 100 years. The approximately 850-strong workforce produces and sells products for various sectors of the rubber, lubricants and plastics industries. The company has subsidiaries and production facilities in Europe, Asia as well as North and South America. Rhein Chemie is a wholly owned subsidiary of LANXESS Deutschland GmbH, Leverkusen, Germany.